A very cheap version of an old favorite. Read on to see our link to a better version that is just like the beloved vintage classic. The newest edition of Trouble by Hasbro. Move backwards, forwards, or to the other side of the board with the new "Warped" spaces. Comes with sixteen colored pegs, a game board, and a Pop-o-Matic dice rolling machine. Recommended for children ages five and up. Like many other updated versions of games made by Hasbro, this one is very cheaply made. Those who enjoyed played the vintage version are best served by avoiding this one. 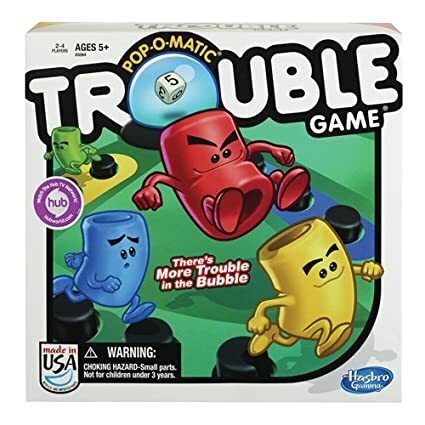 Instead, we highly recommend getting the more durable Pop-O-Matic Trouble. The newest model of Hasbro’s Trouble. Can be played with two to four players. Because this game requires a lot of counting, the minimum age recommendation is five years old. There are a total of sixteen colored pegs- four red, four yellow, four green, and four blue. Each player has to choose what color peg they will be. Then, each player will press the button on the Pop-o-Matic dice roller to see how many spots they can move. Depending on what number you roll, you will either move forward or back. 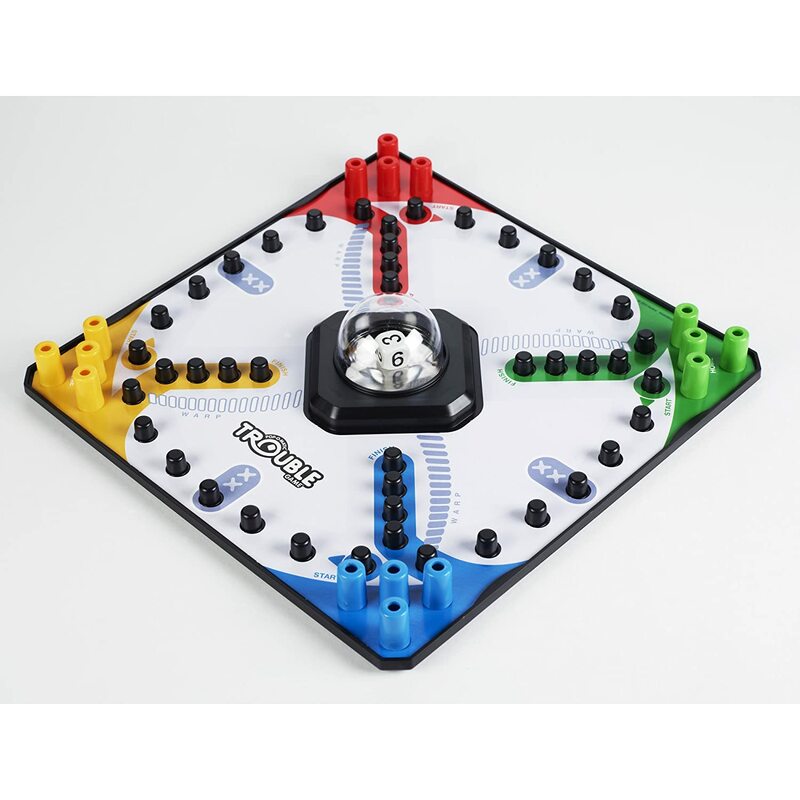 Rotate turns until someone gets all four of their pegs to the finish space on the game board. Whoever gets there first wins! Hasbro’s Trouble board game is a family game. Up to four players are able to play the game. It comes with sixteen colored pegs, four for each player. There is a small plastic bubble that goes in the center of the game board called the Pop-o-Matic. Players can press the button and it will roll the dice for them. Users have said this addition is nice because the dice don’t get lost during play. Users have said this game was a good choice for their young children that needed to work on their colors and counting. Added to the new version, is a “warped” space on the game board. If you land on a “warp” space, you have to move your peg to the opposite side of the game board. There is also a Double Trouble space, and if a player lands on that space, they get another turn. Many users mentioned that the game board quality of this newer version is not as durable and well-made as the classic version from twenty years ago. The board is a very thin cardboard and comes with a flimsy piece of paper that has the game colors and spaces on it that has to be manually attached. Also, a few reviewers said that the board was very small, so when they played it with four players, they had to pick up the board and pass it around to each player when it was their turn. Reviewers also mentioned that it was very hard to press the button to roll the dice in the Pop-o-Matic, and it was especially difficult for young children to press. Unlike the traditional version, the newest edition does not come with the plastic cover with the peg holes to keep the pegs in place. There have been complaints that without this cover, the pegs keep falling over because they’re not sturdy enough to stand up on their own, and when the tiny game board has to be passed around for each player’s turn, they all fall off the board. The game comes with sixteen colored pegs- green, blue, red, and yellow. It comes with the cardboard game board, and a paper cover to put over the cardboard to make the game board. Dice and the Pop-o-Matic are also included. Many users had concerns about the durability and structure of this game. It is said to be made of a flimsy cardboard, and you have to manually attach the paper cover to make the game board. Also, the game does not have the plastic peg-holder cover that keeps the pegs in place throughout the game, so there were concerns that the pegs kept falling off during the game. Whether via a game board with dice, a deck of cards, simple lines drawn on scrap paper, or electronic media, gaming is a global pastime that has enriched culture for millennia. From the most classic tabletop board games to up-and-active, play-to-learn games for preschoolers to the painfully funny party games that satisfy your wild side, Hasbro Gaming is a one-stop-shop for filling your games closet. While continuing to produce some of the most memorable games in the history of family gaming, Hasbro Gaming stays up-and-coming by developing games that incorporate digital content and by partnering with some of the biggest names in entertainment. Hasbro Gaming and all related properties and characters are trademarks of Hasbro.